His Grace Bishop Maxim of Western America visited Monastery Hilandar on the great feastday of Vidovdan. On that occasion he conveyed the greetings of the faithful from his diocese who, with great love and sacrifice, took part in the volunteer undertaking of “Circle 100” collecting, in the first of three rounds, $100,000 to support the renovation of Monastery Hilandar. Encouraged by their wonderful and unforgettable pilgrimage experience on Mount Athos last year on Vidovdan which brought great spiritual benefit to all, the Western Diocesan pilgrims came to an idea while visiting this sacred place of many-century Serbian Orthodox inheritance. With the blessing of Bishop Maxim of Western America, who led the pilgrimage, it was decided to implement this plan, with an appeal to collect financial support for the renovation of Monastery Hilandar. The desire was that in this manner, together with the prayerful support, help be given to Hegumen Metodije and the brotherhood of this sacred monastic dwelling that the renovations might continue in the wondrous monastic complex damaged in the fire in 2004. 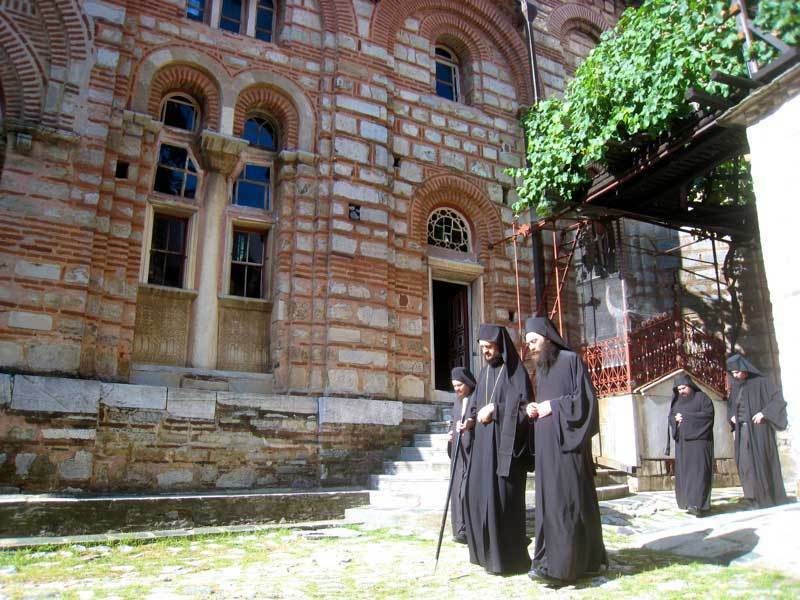 This living monastic community of the Sacred Serbian Royal Lavra on Athos with its cross-resurrection podvig has continuously cultivated the spiritual and cultural heritage of the tradition of Mount Athos. It is only in gratitude to it rootedness in this Tradition that Hilandar was able to remain the most powerful spiritual source for the Serbian people, intrinsic in the entire Serbian history and culture, unmatched perhaps by no other Serbian value. Immediately upon their arrival it was clear that the construction work here was not short term, seeing as the reconstruction of the damaged area of Monastery Hilandar calls for very specific work and knowledgeable skill in renovating the damage in a very complex manner of renovating ancient constructions. Moved by the hospitality of the Hegumen and monastics of this sacred place, particularly their firm belief in the resurrected Lord, Bishop Maxim and Ron Radakovich promised to establish a “Circle 100”, which is based on a three-year accumulation of $300,000. One hundred individuals or families from the Western Diocese will donate $1,000 a year and in this manner will assist the renovation of Monastery Hilandar. Bishop Maxim gave his blessings to Ron Radakovich to led this effort, who not only accepted the bishop's request, but was also, together with his family, the first contributor. To the glory of God and the joy of the participants this conciliar vision and endeavor “Cirlce 100” was successfully realized during Great Lent in 2012. Despite the long and difficult economic crisis which has effected us all, one hundred pious families, in their selflessness and sympathetic gift, offered their humble prayers and monetary aide. Offering much gratitude to all the honorable faithful who, with a pragmatic love, showed their concern for the heritage of St. Sava, with this humble report we express our most sincere gratitude to them for taking part in this communal act of love. Bishop Maxim, at this year's visit to Monastery Hilandar, was welcomed by Hegumen Metodije and the monastic brotherhood on Wednesday, June 27, 2012, on the eve of Vidovdan. Bishop conveyed his sincere greetings to all the honorable donors, thanking God for His great mercy in making this first part of the promised “Circle 100” pledge a reality. Afterward Hegumen Metohije, in walking around the monastery complex showed Bishop and the gathered guests the renovation which has already being done and is currently being done. The bishop was amazed with the success of the reconstruction of the ancient structure which brought back it's original beauty. Filled with joyful impressions at the work being done and completed on the damaged areas, all went to church for the all night vigil which preceded the Divine Liturgy on the feast of the Holy and Great Martyr Lazar of Kosovo. On the occasion of this great feast for the Serbian people, led by his love for the Serbian people, the brotherhood and guests, Archimandrite Vasilios Gondikakis, the former abbot of the Iveron Monastery joined the faithful at Monastery Hilandar. After the eurcharistic gathering, an agape meal was offered during which elder Vasilios spoke on the topic, “Orthodox Christians Do Not Have Enemies”. Bishop Maxim, thanking the Hegumen and the monastics on their hospitality, expressed his hope, God willing, to be with them again next year. We pray to the Lord God that He give us enough consciousness and loving care that we preserve Monastery Hilandar for future generations, that it have the same significance that it has had throughout the thousand year of its existence.